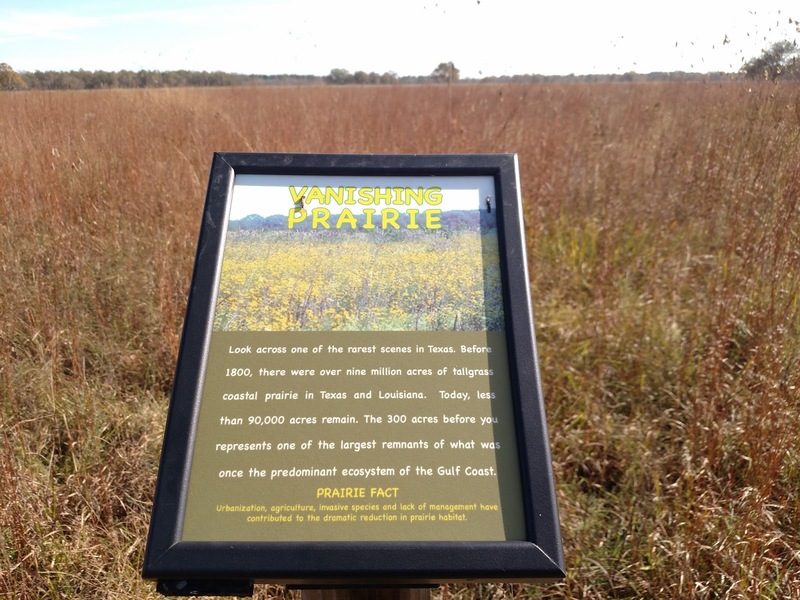 Coastal Prairies once covered 9 million acres, stretching from Corpus Christi, Texas to Lafayette, Louisiana. 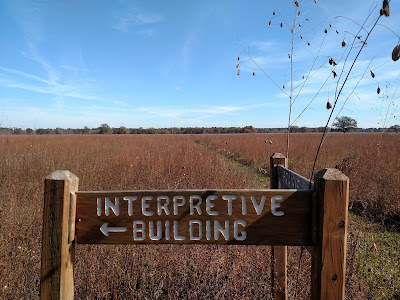 Where midwestern prairies and coastal wetlands merged, it was a diverse ecosystem and crucial habitat. Now less than 65,000 acres remain, less than 1%. 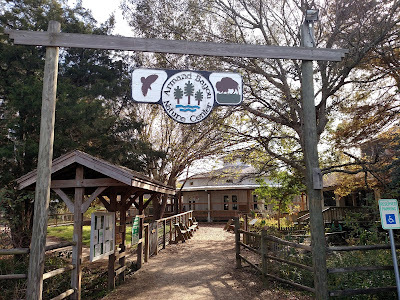 Armand Bayou Nature Center (ABNC) is one of the few remaining sites of this "critically endangered" ecosystem. 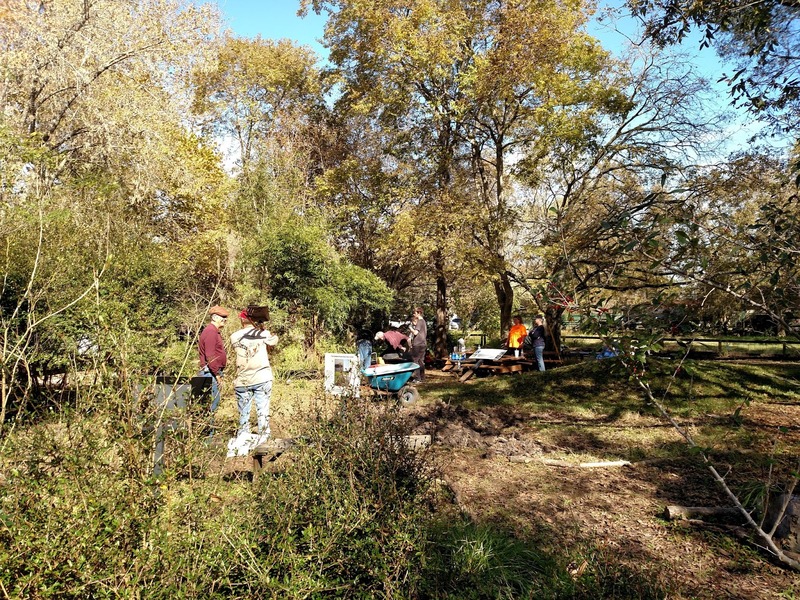 With only two employees and zero government funding, ABNC manages over 550 acres of coastal prairie, a number increasing with their restoration work. So let's visit the site to learn more about coastal prairies—their historic loss and their current restoration, as well as events for getting involved and sources for further research. A buffer zone, protecting inland ecosystems from surges of tropical storms. A water purification system, filtering rainwater entering rivers and aquifers. Habitat to thousands of dependent species, such as the prairie chicken (the most endangered bird in America), and migrating birds such as the whooping crane. A carbon sink, with dense root mats up to 20 feet deep sequestering carbon from the atmosphere. Our natural heritage, reconnecting with the land that provided for our ancestors and shaped our history. 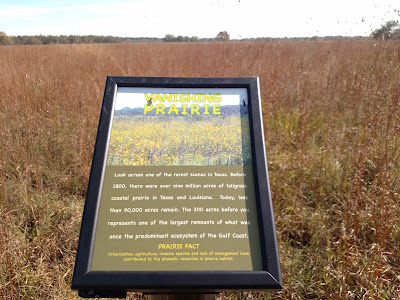 "Where have all the Prairies gone?" Land Use – Development and agriculture have almost entirely displaced the coastal prairie. Sugarcane and rice fields are widespread, as well as pastures for cattle. Prairie species (big bluestem, indiangrass, gamagrass) are adapted to the quick “tip-nipping” of bison, but are suppressed by the continuous grazing of livestock. Building of drainage canals, river dams and reservoirs also significantly degraded many coastal prairies. Fire Suppression – Historically, fire was the defining force of prairies. It regenerated fire-adapted natives, and prevented encroachment of woody invasives. Without fire, diverse prairies are displaced by a monoculture of shrubs. First established in 1974, stewards of ABNC soon realized that active management was necessary if coastal prairies were to survive. 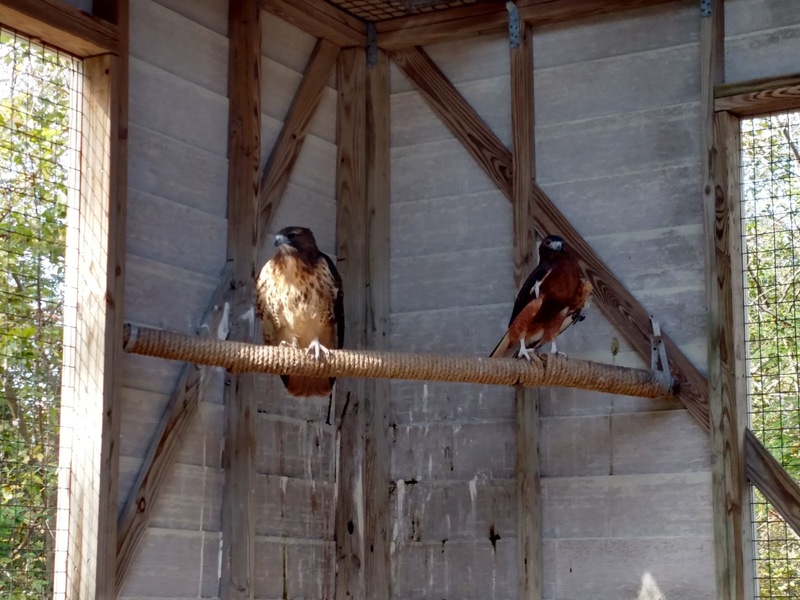 "Buying property, putting a fence around it, and letting mother nature do the rest was not working," according to Mark Kramer, stewardship coordinator at the Center. Ecosystems degraded by humans now depend on humans for their restoration. Prescribed Burns - Prairies are fire-dependent ecosystems, so restoring fire is key. ABNC has been conducting prescribed burns since 1978. Burn plots are less than 25 acres, surrounded by control lines (15ft-wide mowed paths or other fuel-free natural barrier), and burnt on 3-year rotations. Fun facts: they have never suffered injuries or equipment damage (knock on tallgrass). There have been 'escape fires' on two occasions however, which required intervention by the Pasadena FD. "We've learned more from these failures than from our successes," says Mark. 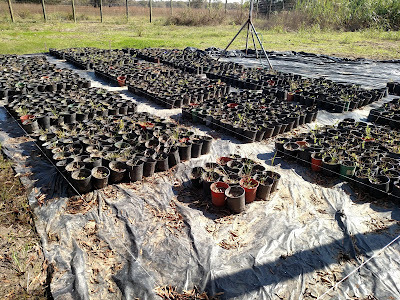 Planting – The ABNC nursery is propagating 20,000 native prairie plants in 1-gallon pots for transplant. 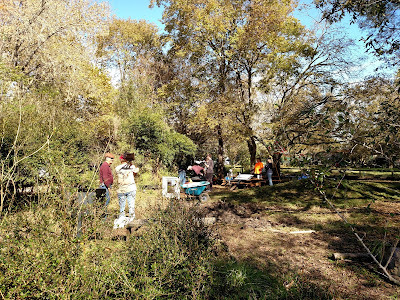 ABNC allows volunteers to participate in prescribed burns, mostly as 'flappers' (the kind smothering flames around a fireline, not wearing provocative dresses in the 1920's). Contact Mark Kramer for a training brochure and a certificate upon completion. Then join the e-mail list and await the call to action. Burn season begins in January. Several sites in throughout southeast Texas have weekly prairie restoration events.